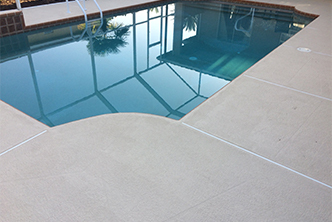 Bring new life to your pool decks and lanai surfaces with our decorative coatings or sealers. Choose from a range of low to high gloss finishes that are resistant to harsh pool chemicals, mold, mildew and the harmful ultra violet rays that Tampa sunlight can cause. Quality coating materials are available for surfaces like flo-crete, cool deck, brick pavers, travertine an other natural stone surfaces. There are many vibrant colors to choose from that will bring beauty to your deck. Also, slip resistant products are available for those who have safety concerns. Even the best cement surfaces crack after years of expansion and contraction. 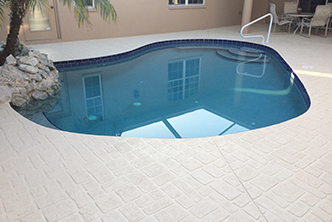 If you are noticing fractured, chipped or stained areas and you don’t know what to do to repair them, now may be the perfect opportunity to start a pool or lanai project with us. 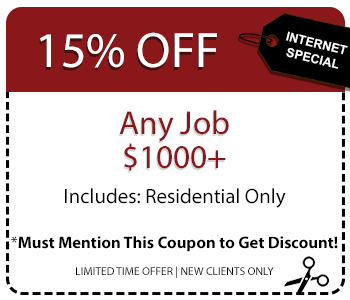 Many years of expertise can save you time and money by using the appropriate materials in repairing these defects. A typical pool deck or lanai may cost less than you think. With all of projects, we pressure clean and degrease the surface; remove any loose coatings; fill in cracks and apply two coats of a quality water-based stain or sealer. With no additional charge, we can add slip-resistant material such as sharkskin or silica sand. A must is a good pressure washer with an orange degreaser or another quality commercial degreaser. Quality urethane caulk or flexible epoxy crack fillers are needed to fill cracks. Minimum two days is needed to dry out the floor prior to applying the concrete stain or sealer. A good quality stain or sealer is recommended from a paint store verses a DIY warehouse. Whichever option you choose, we hope you LOVE your new or renewed pool deck coating! 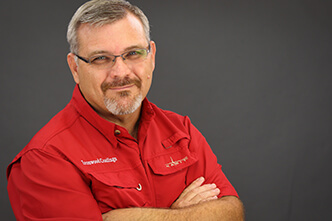 And please let us know how we can be of assistance by calling (813) 603-7572.